Question: Why another book on how to fly fish for trout? Answer: Because all of the books out there offer too much information for a beginner. This is all you need to know to get started. If you are a guy or gal who just wants to try this sport and enjoy the little time you have to go fishing, this book will get you on the stream and catching fish sooner than the others. Besides, once you understand and, more importantly, experience what is offered here, all the other books will make much more sense. Also included in the Fish Tales section are true stories outlining strategies, tactics and techniques as well as descriptions of some of my favorite fishing spots. Tom McCoy is a lifelong fisherman who loves to fly fish for trout but also enjoys all that the saltwater has to offer from his home base on the Long Island Sound to the Florida Keys. He has fished mountain streams north, east, south and west. In this collection he shares these adventures with a lifelong friend named Mack. “Sometimes you have the good fortune to meet a buddy early on and get to share your life with him.” says Tom. “At first it’s in school or on the ball field and later through correspondence. Letters at first, then email. 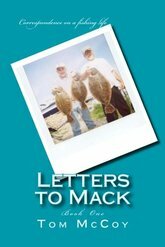 This book is a collection of those letters on fishing, hiking and life."